BEGINNER classes consist of a 9 week curriculum that introduces students to safety, form, shot sequence, and focus. Upon completion, all students should be able to execute the correct shot sequence, from stance to follow-through. School bows are available to all students. INTERMEDIATE & ADVANCE classes are available for those who successfully graduate from ("test out") the beginner level.Emphasis is on refining form and concentrating on proper aiming. Students also are strongly encouraged to obtain their own equipment. Advanced students must have their own equipment, and it must be approved by the director. JOAD The Junior Olympic Archery Development Program is an opportunity for promising young archers to work intensively on the skills necessary to excel in a competitive environment. JOAD students attend two classes per week and are required to participate in the weekly X-Ring Archery League (see below). Students also travel to local, regional, and national competitions. PRIVATE & SEMI-PRIVATE lessons are available to individuals wishing to pursue a more individualized course of instruction in order to advance their skills more quickly or address specific issues. Introductory, Birthday parties, Promotional, Private & Semi-Private classes are by appointment only, Tuesday – Sunday, 9:00am to 5:30 pm. Call for exact scheduling. Schedule is subject to change without prior notice. A recreational (handicap) league and open shooting are held weekly, Tuesday-Friday at 7:30. These are open to both students and the public. Leagues run 15 weeks, followed by a "Novelty" shoot on the 16th week league awards, pizza, prizes, and lolts of fun. X-Ring Archers also hosts birthday parties, corporate team functions, after school enrichment programs and summer archery camps. Contact the school director for more details. X-Ring Archers provides both individualized sales and expert service of equipment to students and the public. 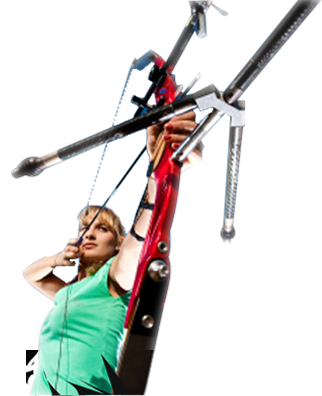 X-Ring is an official Hoyt and Martin Pro-Shop, plus we also sell most other major brands (PSE, Reflex) as well as a wide variety of archery accessories. "Just a quick note to let you know how much my son, Zack, and I enjoyed the beginners Archery classes. I had not picked up a bow in over 8 years, and Zack was new to the sport. Each one of us learned exactly the same way, at the same pace. and neither one of us missed anything - a real tribute to the school's teaching style. We've continued to practice at our own home "range". I was able to "un-learn" all of the past bad habits I had, and correctly switched from left handed shooting to right handed shooting while Zack was able to quickly out-shine dad in the proper form department. Keep up the good work and we'll be back for more advanced lessons."